Did I guess it right? This is the typical Italian wine landscape and yet, you would never tell it is possible to find a wine cellar in a totally different context, that is THE METROPOLITAN CITY OF MILAN. Yeah, you heard me: I’m speaking of Cantina Urbana, the brand new wine-making and tasting spot along Navigli, the evocative canals crossing the city. 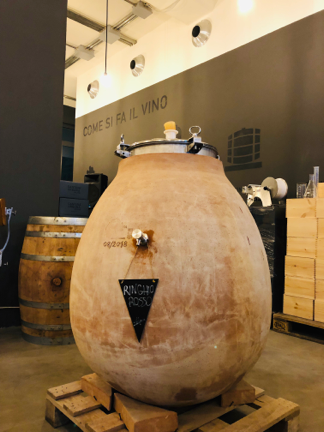 Cantina Urbana is the very first example of urban wine cellar in Italy: a concept created and developed by Michele Rimpici, a professional in the wine business and marketing. The idea behind Cantina Urbana is to draw the average urban dwellers closer the wine making process, enabling them to see what’s behind a bottle, taste and even create their blend. The industrial concrete and glass open space is perfect for this purpose: it keeps everything visible, just like the grapes and musts carefully selected and coming from (unofficial) sustainable agriculture and the natural wine-making style with spontaneous fermentation, alternative aging vessels like clay and almost zero sulfur dioxide added. A virtuous and transparent production cycle that ends up in your glass for a minimalist aperitivo with a pairing of cheese and cured meat or, if you don’t feel like plunging in the happy hour frenzy, that can be delivered directly at your place. What did I find at Cantina Urbana? First of all a convivial atmosphere, due to the wide space surrounded by working tools, writings on the walls and long tables with benches to be shared. Michele is a wonderful host, always around and available for any explanation and some good time. The same goes for the employees, a smile on their face and a pouring bottle in their hand, ready to greet and treat the guests with a tour of the cellar and custom-made tasting. What did I drink at Cantina Urbana? What I mentioned before regarding the atmosphere is reflected in the wine: simple, natural, made to be shared. Of course the whole selection is still very young, fair enough since they started last October: however I was very pleased to acknowledge that, in the long term, the wines are extremely promising. El mòs - 100% glera: this Prosecco-style sparkling wine has a particularly intense aroma, due to the Charmat method which enhances its fruity notes. It is light, full and tasty, perfect with friends eating together or simply on its own before a meal. Tranatt bianco - 50% garganega, 25% trebbiano d’Abruzzo, 25% sauvignon: the wine to be paired with food, light, fresh, balanced; it is best friends with vegetarian or seafood risottos and pastas. Ringhio - 100% corvina: this one hasn’t been bottled yet, a wine-in-progress fermented in clay. Nose is clean with red fruit notes, mouth is still very young and acidic but after the sip it leaves a delicious hint of strawberry yogurt..yummy!